I played with a recipe today… and ended up with the yummiest (and most simple) scones I’ve ever tasted. A friend had posted this 3-ingredient scone recipe from TheMiniatureMoose.com on Facebook and I couldn’t help myself… I *had* to try it! Of course, I just can’t make a plain scone, so I picked up some mini chocolate chips and decided to use some of the Chardonnay that I had in my fridge… it was a HIT! I took most of the scones downstairs to the Leasing office and treated the ladies to an afternoon snack and they agreed with me. 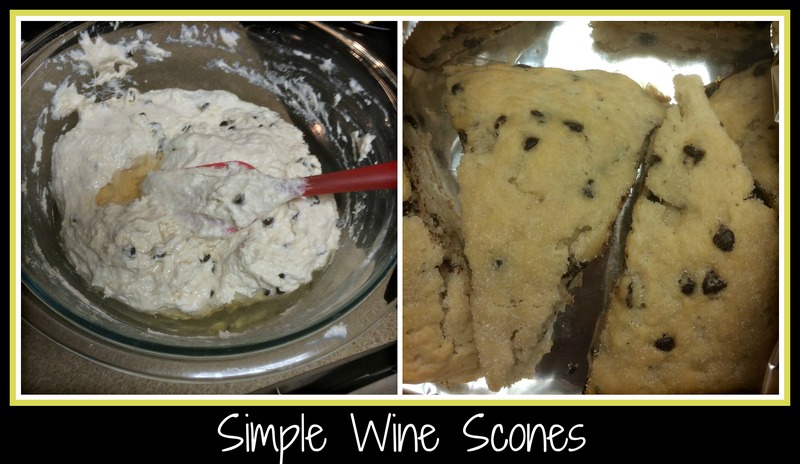 Yummy & easy… wine & chocolate… two of my favorite combinations. My version differs at this point with most recipes for scones. Everyone else will say to be gentle with your dough and to kneed the dough and do all sorts of lovely things to form your scones. I was simply lazy and wanted to see if this recipe would still work, so I stirred in some Chardonnay (a bright stainless-steel Chardonnay is great in this recipe, especially if you choose to add any citrus to the mixture) and made sure that everything was well-combined. I then spooned the scone dough (it was definitely not something that could be cut into forms at this point) onto a pan sprayed with cooking spray and sprinkled the dough with sugar. I knew I was going to want to cut the dough into pie-shaped wedges, so I tried to make slight indentations into the top of the dough so I’d know where to cut. Much more than this wouldn’t have worked with this version of the recipe. I baked the scone dough at 425 degrees for 17-20 minutes until the top started to look lightly browned and didn’t look like it was going to be gooey when it cooled. Ok, this isn’t a very “scientific” way to describe it, but it’s the most honest way I can explain it. I shook the pan and nothing moved… then I pressed the top of the dough and it felt pretty solid. I figured it was good to go at this point. I removed the large cooked scone to a cutting board and allowed it to cool for a few minutes. I then took a knife and cut the dough, following the pie-shaped wedge marks that I’d originally made. They came out nicely puffed and light – not dense or dry at all. I might just bake them in small rounds next time…. they would be lovely as a dessert, broken open and drizzled with fresh strawberries and whipped cream. See… even a diversion from a tried-and-true recipe can turn into something totally different and fun! Let me know if you come up with a new way to play with this recipe… and I’ll be sure to add other versions as I play with this recipe on my own! Wishing a Happy Summer to you all!